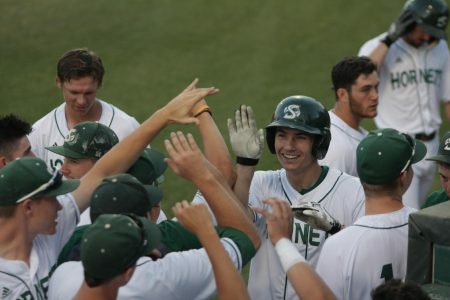 Sac State senior outfielder Bronson Grubbs (#2) jumps and high-fives teammate, junior right-handed pitcher Austin Roberts, after scoring a run in a 5-3 loss to UT Rio Grande Valley Sunday at John Smith Field. Grubbs had one hit, one RBI and one run scored in the loss. 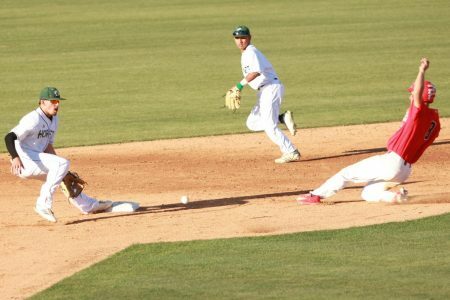 Western Athletic Conference play began Friday for the Sacramento State baseball team, who entered the weekend series on a win streak and seeking to extend it to double-digits. The Hornets (15-8, 2-1 WAC) took on the University of Texas Rio Grande Valley Vaqueros (15-9, 1-2 WAC) in the first conference matchup of the 2019 season. 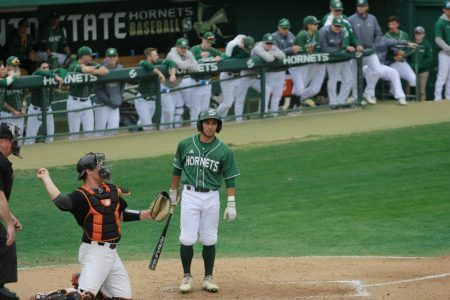 Sac State came into the series on a nine-game win streak with victories over Towson University, San Jose State, Rider University and the University of California, Davis. 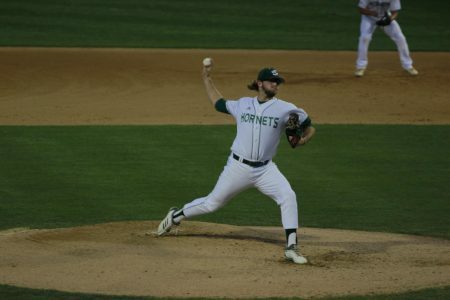 The Hornets and Vaqueros matched up Friday in a pitchers duel. 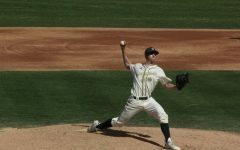 Sac State junior right-handed pitcher Parker Brahms toed the rubber against UTRGV senior right-handed pitcher Trevelle Hill. Brahms pitched seven innings, allowing three hits, two earned runs and one walk with seven strikeouts. Hill pitched six innings and allowed seven hits, two earned runs and had six strikeouts. 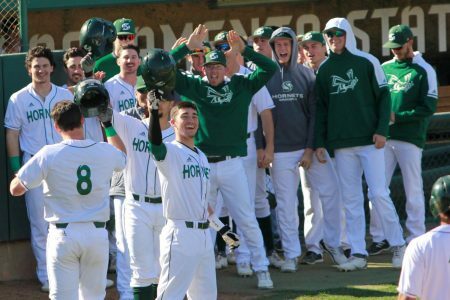 Sac State got on the scoreboard first in the bottom of the fourth inning when freshman outfielder Trevor Doyle tripled to right-center field to score sophomore infielder Steven Moretto. Moretto got an RBI of his own in the sixth inning with a double down the left field line, scoring junior outfielder Matt Smith. The Vaqueros tied the game in the top of the seventh inning on a two-run home run from junior infielder Christian Sepulveda. 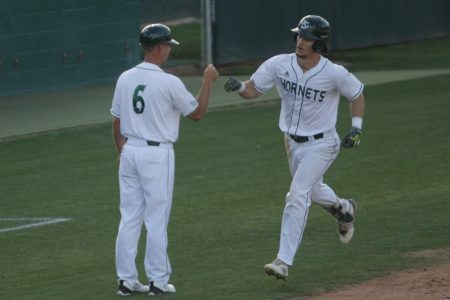 The Hornets responded with two runs of their own in the bottom half of the seventh inning to match the Vaqueros and retake a 4-2 lead. UTRGV sent the game to extra innings with two runs in the top of the ninth inning. 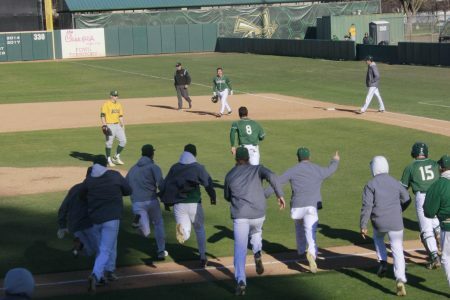 Sac State won its 10th consecutive game with a walk-off double in the tenth inning. Sophomore catcher Dawsen Bacho launched a ball to left field to score Doyle for the game-winning run. 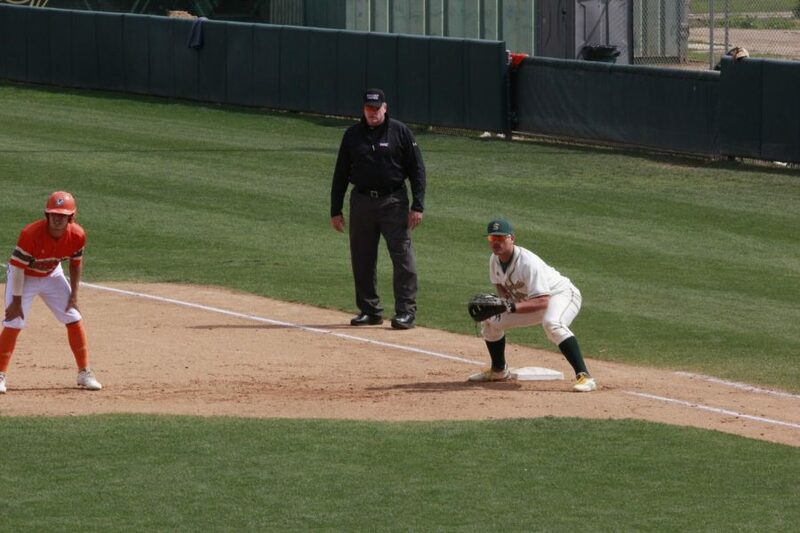 Sac State freshman catcher Martin Vincelli-Simard plays first base and prepares to pick-off the base runner in a 5-3 loss to UT Rio Grande Valley Sunday at John Smith Field. Vincelli-Simard had two walks and two strikeouts in the loss. The Hornets came out Saturday and put on a dominating performance, winning 7-1. Sac State scored four runs in the second inning, two in the fourth and one in the seventh to seize their 11th consecutive victory. 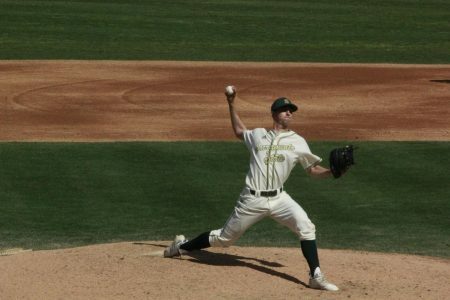 Freshman right-handed pitcher Travis Adams pitched 4 ⅓ innings for Sac State, allowing nine hits, one earned run and one walk with four strikeouts. Sac State came into Sunday’s contest looking to extend their win streak to 12 and tie the team record for longest win streak in the Christiansen era that was set back in 2014. The longest win streak in program history came in 1992 at 16 consecutive games. 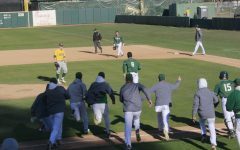 The Vaqueros not only wanted to avoid the series sweep but to also win for the first time at John Smith Field as they had an all-time record of 0-8 entering Sunday’s game. 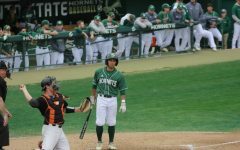 The Hornets scored first with one run in the third inning and two runs in the fourth inning to take a 3-0 lead. Smith hits a sacrifice fly to score senior OF Bronson Grubbs from third base. All runners advance. Sophomore INF Steven Moretto steps up to the plate with two outs, with runners on second and third base. From that point on, the Vaqueros came back to retake the lead and never looked back. In the top of the fifth inning with the bases loaded, UTRGV junior catcher Conrado Diaz doubled to right-center field to clear the bases and tie the game at three. Diaz knocked Sac State sophomore right-handed pitcher Scott Randall out of the game with his hit. Randall pitched 4 ⅓ innings allowing four hits, three earned runs and four walks with five strikeouts in the series finale. The Vaqueros came out in the sixth inning and took the lead for good at 5-3 following a two-run double from senior infielder Anthony Gomez. The Hornets had their chances to score Sunday as they left 15 runners on base. 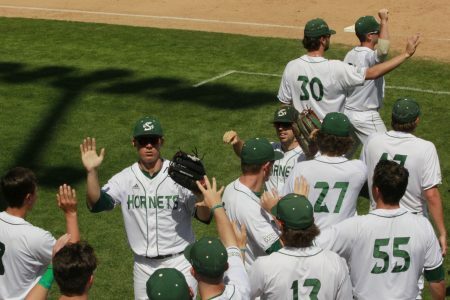 The Hornets will seek to get back on the winning track Tuesday against the University of California, Berkley Golden Bears (11-10, 2-4 PAC 12) at John Smith Field. 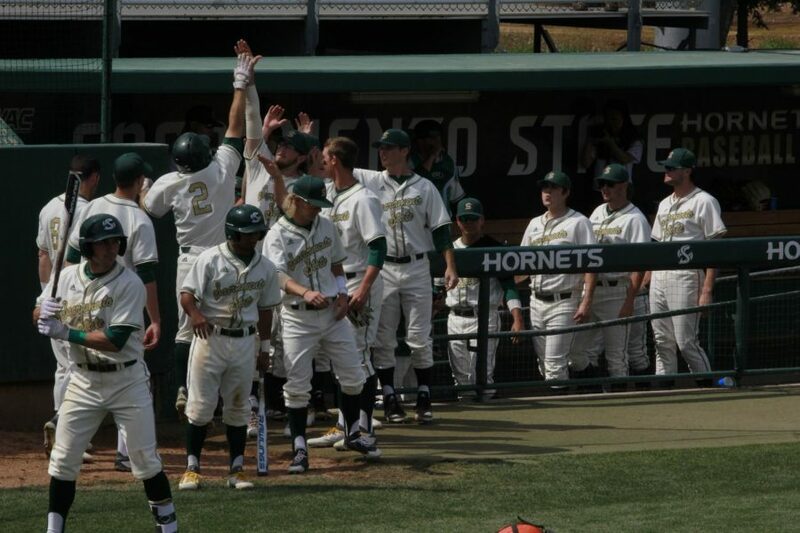 Sac State won in Berkeley last season 4-1. Tuesday’s game will be the finale of the season-long 13 game homestand. First pitch is scheduled for 7 p.m.